This is what our boys are fighting to protect, keep and treasure. The Sioux Falls Storm will host the Nebraska Danger and the 2015 United Bowl in the new Storm Shelter at the Denny Sanford Premier Center on Saturday, July 11th, 2015, at 5:00 pm central time. The Storm are undefeated this season and looking for their 5th straight IFL title, and their 9th national title since becoming a pro indoor football club with the UIF as the Cobras in 2000. The Sioux Falls Cobras became the Storm and the United Indoor Football league merged with the Intense Football League to become the Indoor Football League. The Sioux Falls Storm currently hold the record for the longest winning streak in pro sports with a streak of 40 consecutive game victories under the leadership of head coach Kurtiss Riggs. 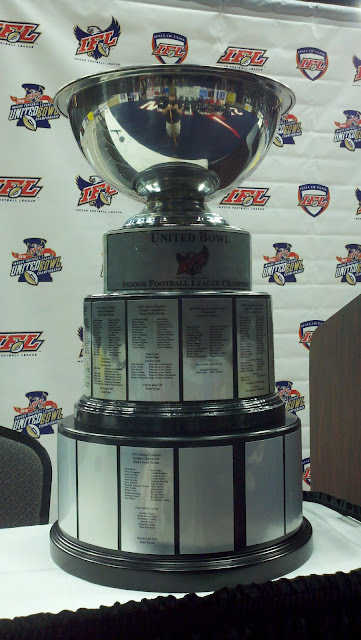 The Nebraska Danger are making another showing at the United Bowl as the Intense Conference Champions. This will be Nebraska's third visit to the IFL championship contest. Since the Storm lost RB Tory Harrison when he was brought up to the CFL's Calgary Stampede, the Storm have relied on the diversity of their running backs to accomplish goals and have become a run-first team as opposed to previous year championships under the guidance of QBs Chris Dixon (Hall of Fame Inductee for 2015) and Terrance Bryant. The Danger are no slouch themselves, with QB James Sewell announced as the IFL's 2015 season MVP, and fellow teammate IFL Offensive Rookie of the Year Waymon James on the ball. But the Storm have more All-IFL teammates and Kurtiss Riggs is known for his ability to adapt and exploit his opponent's weaknesses. It will be a great contest, as the Danger have visited the Storm Shelter only 3 weeks back and say they are ready to feed off the electricity. Tickets are still available, or you can watch it on IFL Live TV.